If you’ve been dealing with chipped, cracked, broken, decayed, or missing teeth, we want you to know that Dr. Dan Rairigh can help restore your smile. Thanks to his artistic touch and use of the latest technology, he can create life-like restorations that can make even the most damaged teeth look like new again. He can turn back the clock for your smile in as little as one appointment. Whether you have a single tooth or a few teeth in need of repair, he’s able to help, so contact us today for an appointment. A dental crown enables our team to put back together even the most fractured, decayed, or weakened tooth to restore its original strength and appearance. We can make your crown from a variety of durable materials so that once we repair a tooth, you can trust it to stand the test of time. We are even able to manufacture our own crowns in-house so you can get what you need faster and for a lower cost. 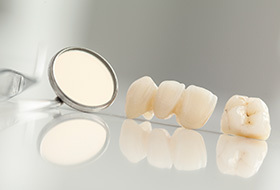 Crowns can be used to replace multiple missing teeth in a row as well. 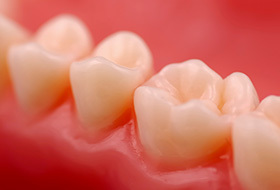 When creating a bridge, we place two dental crowns on the teeth surrounding the gap in a person’s smile, and bond prosthetic teeth in between the crowns to close the space. This not only restores a person’s appearance, but it also evens out the bite and prevents the remaining teeth from shifting out of place. We can provide an bridge option that is held in place using dental implants to deliver an even better result. When it comes to repairing small cavities and slightly damaged teeth, our practice only uses tooth-colored fillings. They are made of a composite resin material, and as the name indicates, they can be color-matched to perfectly blend in with a patent’s enamel. This makes them practically invisible inside the mouth. Even better, they also allow us to better preserve your natural tooth while repairing it, leaving more of its structure intact. The end result is a tooth that looks great and is also built to last. 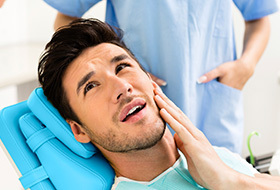 Traditionally, the process to get a tooth repaired with a dental crown involved two appointments, a messy dental impression, and 2-3 weeks with an unreliable temporary crown in your mouth. Thanks to CEREC® technology we can design, fabricate, and place a completely customized crown in just one well-planned visit while you sit and relax in our office. Now, you can save time and hassle without sacrificing quality. 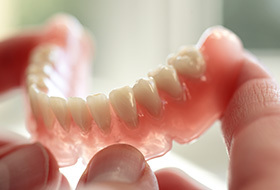 Dentures give us the ability to help a patient who has experienced a significant amount of tooth loss. We can fully restore a person’s ability to eat, speak, and smile with confidence. A partial denture can replace numerous teeth while fitting in comfortably with the remaining ones (like the piece of a puzzle), while full dentures can bring back an entire row. No matter what you need, Dr. Rairigh will use his artistic knowledge to make you a denture that looks just as great as it feels. While it’s fair to say that root canals don’t exactly have the best reputation in dentistry, the fact of the matter is that they can relieve even the most severe dental pain and save extremely damaged/decayed teeth from extraction. 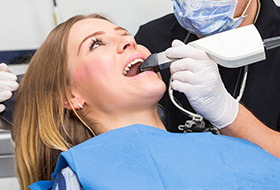 At our office, thanks to modern-day dental techniques including local anesthesia and sedation, you can trust that this procedure will be the solution to your discomfort.